The idea is that active students learn more, and students who are interacting with one another are active. I believe that we all recognize this. We might be searching for specific information in books and Internet, and in the process we learn several other things since we are reading the text to find the information. We might have a problem and we discuss it with our colleagues (peers) and in that discussions we get new knowledge that will help me solve the problem. Learning communities is about learner-to-learner engagement. You get to know the other students and they get to know you, and then together we make meaning of the content in the course. One comment that Dr.Palloff and Dr. Pratt made was that it should “empower students to take responsibility of their own learning” and if it works at it supposed to, it will “transform students into scholar practitioners” (Laureate Education, 2010). Other positive changes are that students become reflective, increase the self-direction, reinforce their sense of presence, and break the isolation. 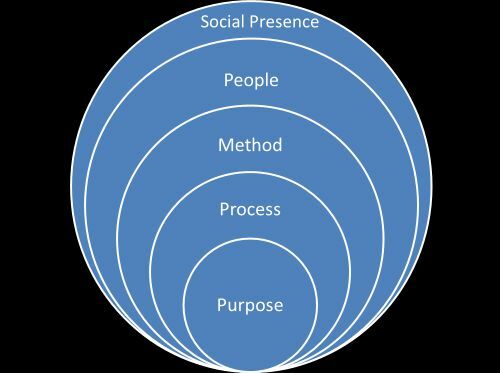 There are several elements of online community building; people, purpose, process, method, and social presence. All of them depends on another and play off one another. However, it is not just to bring those pieces together and then we have a learning community. It will not just happen! I believe we need to start with the purpose. Why would people come together to interact with each other? The answer to that is not always that they want to learn something, but creating a course with the target group and their needs is a good place to start. On that purpose we as instructor has to create the process, the way the course is designed to take a learner from the start to end, but also the way it is designed to engage the learners. In that process we have to add methods so learners are able to interact, and communicate, and connect with each other. The process and methods are key to community building. We have then created an environment where we now can invite people, the learners, into, and give them the opportunity to start develop presence. We cannot expect everyone to be capable of developing a social presence immediately, therefore, it is important that we give instructions on what to do and when, to help the learners to get started. Then it is everyone’s responsibility to participate and interact with each other, otherwise there will not be a successful learning community. One issue that could exist is the lack of knowledge of technology and online study, which could result in loosing learners since they become overwhelmed with everything. Having new student orientation will help students to understand all this new things as well as getting to know each other before they start the actual course. If it is not possible to have that, we have to use the beginning of the course to help them understand and learn all this things. The instructor of the course is the facilitator and need to be the one setting the tone in the classroom and make it a warm and inviting place to be. That person needs to be involved in the entire process, and slowly cultivating students into the communities. One thought I got reading and listening to this week’s resources is that even if we are talking about online teaching, all of this can be applied to a class on campus, that we meet face-to-face. I will be following you! Yes Millan, I also feel that this course will delve further into the into the Foundations of Distance Education and provide us with more structural Online Learning Strategic understanding of the Social importance of the online strategies and community. According to Simonson, Smaldino, Albright and Zvacek (2012), as instructional designers it is important to understand millennial learner and there “tech-savvy” capabilities and their addiction to social networking services which is already a realistic part of their virtual world in the Online Community. Interaction and Engagement very serious elements to our learning. I think you present a solid direction on building the foundational aspects of an online learning community. The reponsibilities of the individuals involved and how to get their participation to achieve a learning environment that prospers everyone. Although, I do think community can provide enjoyment, it behooves the individual to communicate appropriately and not simply out of necessity. This is why I think the instructor has to communicate the expectations and not simply standards. Isaac, You are so true that community can provide enjoyment. My experience is that it depends a lot on the people involved. I have had courses where the community experience has been a joy and I hardly had to do anything to make that happen. Then another year, the same course, but other students it is impossible to make it happen. Maybe the need of the community is not there, I do not know. I have a little bit of an issue with the statement, “Active students learn more.” I have always been one who is a “WATCHER”. I have also always been one who performs better as an independent learner. I like to learn things on my own. I like to view the opinions of others but not necessarily respond to them. That doesn’t mean that I’m not learning from them but would rather not express an opinion per se. Being a watcher still might mean being active. Active is the opposite to passive which is when students just sit and listen, and do nothing more. I have students today that do that, and are then suprised that they did not learn. I agree with both of you. I am also one who would rather take the independent learner path. Most of the time, I would also rather be a watcher and actively read and think about the other posts but not necessarily be required to respond. This description takes me back to the readings we had which characterized this behavior as “lurking” but then renamed this kind of student as an “eventual participant”–“participants who were highly engaged in learning but less visible in the online discussions learned from reading and analyzing other people’s contributions. Hence, it is inappropriate to give them the negative label of lurkers” (Ziden, Fook, Idrus & Ismail, 2009, p. 206). Millan’s comment supports this description which acknowledges that this kind of learner is engaged and active. Your post gave me another way to look at the student activity involved in online communities when you quoted Palloff and Pratt Laureate Education 2010 that it should empower students to take responsibility for their own learning. They are right it is very thrilling to complete a project on my own or with the help of fellow students through emails, cellphones or Skype. Palloff and Pratt Laureate Education 2010 made the statement that students challenge one another and also that students become professional help for one another. I agree with the fact that we help each other out professionally. I have found that there are some really nice people in our classes; they reach out through emails if they have a question or I have been able to email classmates for technical help and they have come to the rescue. My classmates have saved me when it came to having to learn Photoshop. Your blog post was informative and it caused me to think more about online communities and reflect on how true these readings and videos are. For the most part they are on point. I have personally bridged the learning gap through social media. Laureate Education (Producer). (2010). Evaluating distance learning theory [Video file]. Retrieved from https://Class.waldenu.edu.